MapXplorer.com's un|earth:: mapping app now includes a rolling 30-day archive of Sentinel-2 satellite imagery over Australia. This new information layer extends the un|earth:: app's functionality with higher frequency and higher resolution data source, which allows for monitoring landscape changes on a 5 day cycle (2-3 days where satellite flight paths overlap) and for areas as small as local paddocks. New imagery is released daily, within 24 hours of its acquisition. The un|earth:: app's initial focus was on enabling access to historical Landsat data over Australia that dates back to 1986. 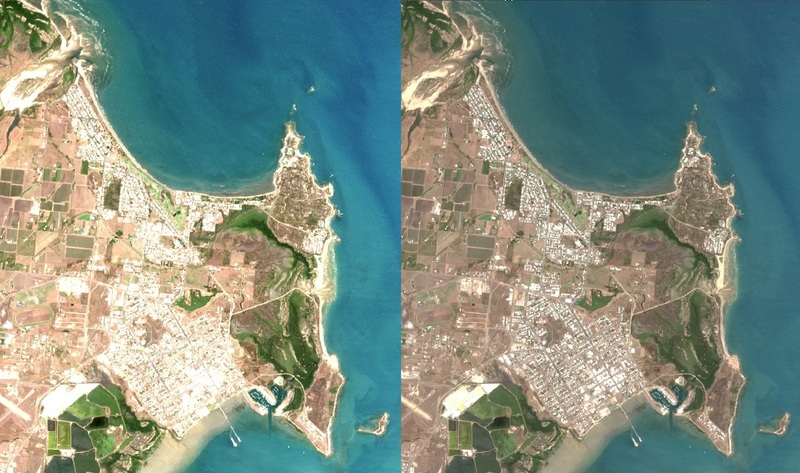 With resolution of 25m per pixel and a 16 days revisit cycle, Landsat satellite imagery is an excellent source of information on changes occurring in a local landscape over an extended period of time. However, the latest information is published with a few weeks delay. 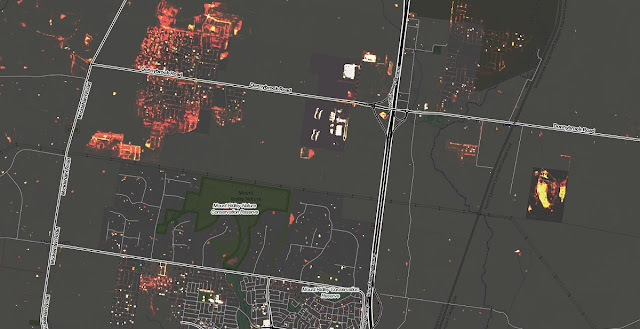 The new Sentinel-2 imagery layer closes the time gap to just hours post data acquisition so un|earth:: app users have now access to continuously updated satellite imagery as well as historic archives. Sentinel-2 satellite imagery has resolution of 10m per pixel and is available free of charge from the European Union's Copernicus Program. Geoscience Australia processes the data into a higher, surface reflectance and terrain corrected level product - to eliminate the effects of atmospheric distortions and terrain shading from the underlying data. The so-called "analysis ready" data is then made available for use by third parties in a variety of formats. It all happens automatically and within hours after Sentinel-2A and Sentinel-2B satellites fly over Australia. MapXplorer.com's advanced, in-browser, real-time processing technology means there is no need for downloading bulky GeoTIFF files and viewing their content on specialised desktop software, one at a time. Our technology simplifies the distribution process of terabytes of Earth observation data, cuts both the cost and time involved in publishing complex spatial information, as well as reduces the level of expertise required from end users to utilise the underlying data. 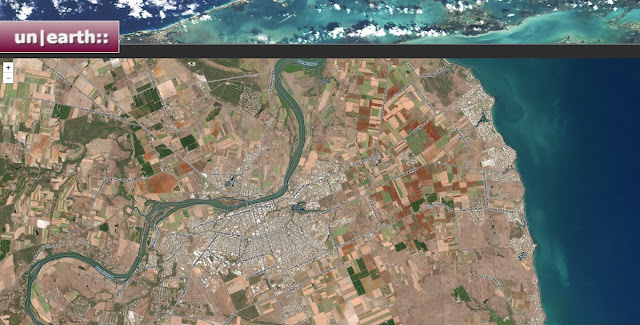 un|earth:: app supports the use of satellite imagery on both mobile and desktop devices. Current functionality of the un|earth:: app supports only the most basic use cases and is meant to facilitate the introduction of remote sensing principles and theory to the novice users. In particular, image filter presets were created with the objective to enable changing the presentation of displayed satellite imagery between several different effects with just a single mouse click. So, users can now quickly switch from true colour RGB image, displayed using Light and Bright filter (as the default option), to a more vibrant colour version (by applying Full Vibrance filter) or versions that that highlight specific landscape features such as exposed earth - displayed in bright orange/red colours after applying Inferno filter, or green vegetation - displayed in bright green after applying Pastures & Greens filter. More custom options for mixing and matching bands are coming soon. MapXplorer.com's un|earth:: app is a proof of concept technology, created and maintained with funds derived from online advertising presented to the visiting public. Please support our sponsors by reviewing and following through on their offers. We welcome any feedback and inquiries regarding sponsoring functionality improvements or custom deployments.